Voices of the Generations recently made a visit to Bishop Conaty Our Lady of Loretto Catholic School in Los Angeles on Feb. 10. 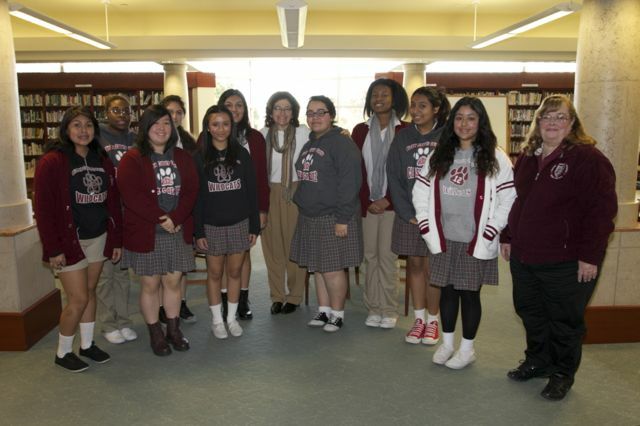 The visit was hosted by Lisa Gabriel and her 12th Grade Holocaust Studies Class. Julie Kohner made her VOG presentation to the class, who have been attending a Holocaust elective course since September 2011. This full year course begins with a study of Judaism, followed by an understanding of the Zionist movement, and events of the early 20th century that eventually led to marginalization of the Jewish People in Europe, and the genocide that followed. To show that not all Holocaust stories had such tragic endings, Julie presented her parents story through Hanna Kohner’s survival and presenting “This Is Your Life”. The all-girls class were moved and inspired by the show, and by Julie’s telling of the background, and her time growing up as a child of a survivor. The class members asked intelligent and thoughtful questions. With help from the Los Angeles Archdiocese and your contributions, we can bring Voices of the Generations to as many as 50 high-schools in the near future.